Donald Trump is viewed with much amusement in Iran – his rhetoric and inflammatory statements remind many of their former hardline president Mahmoud Ahmadinejad. 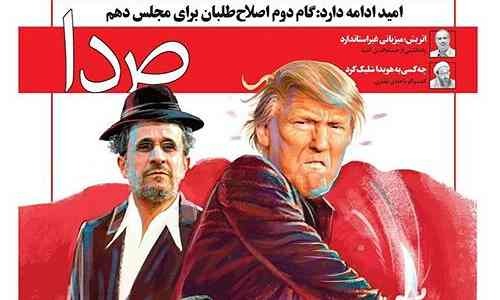 Seda, a reformist weekly publication, recently published a special report examining “the phenomenon of Trump and his similarities with Ahmadinejad”. Its front cover carried a film poster sketch that depicted the Republican frontrunner wielding a scimitar with the former Iranian premier in the background wearing a cowboy hat. “Populists united?” read the big headline. The US presidential race is mostly seen in Iran through the prism of the landmark nuclear deal, struck between Tehran and the world’s six major powers last summer in Vienna. That accord came into force in January when sanctions against Iran were officially lifted as part of the implementation process. The big question among Iranians is whether the next US president will continue signing waivers to Iran’s nuclear-related sanctions. A refusal to do so can put the accord in jeopardy. The Iranian authorities have refrained from publicly endorsing any candidates in the race to the White House, but in private there are concerns about the consequences of the election’s outcome on the nuclear agreement. Even Hillary Clinton, the Democratic frontrunner, is believed to hold a more hardline stance on Iran than Barack Obama. Iran has not always been a passive observant – many believe that Tehran, in the middle of the furore over the infamous hostage crisis more than 35 years ago, played a crucial role in the coming to power of Ronald Reagan in the 1980s. Trump was not an entirely unfamiliar name in Iran before running for president. At least five of his books have been translated into Farsi and people have read about his business dealings. Iranian MP Avaz Heydarpour Shahrrezayi, who sits on the parliamentary committee on national security and foreign policy, believes that a Trump win will not affect the nuclear deal as the US Congress, he said, is bound to respect international treaties. “Trump or anyone else winning would not be able to nullify the nuclear deal,” he said, according to the Iranian news website Tabnak. Nasser Hadian, a university professor, told the reformist Shargh daily this week that Iran would benefit more if the Republican frontrunner becomes president. “It would be easier for Iran to work with Trump,” he said. According to Hadian, Trump lacks credibility among the US’s European allies and it would be much harder for him to unite them against Iran in the future, which makes it easier for Tehran to avoid a concerted western front. “The only thing he [Trump] can do is to start a war and we should be careful about that,” he added.